We love a good family game night. 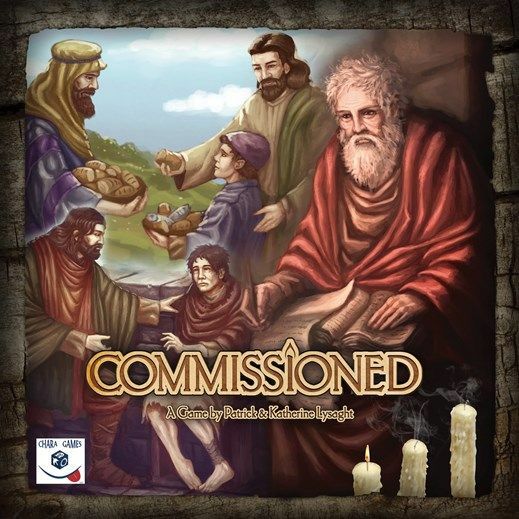 We recently had the opportunity to review a new game from Chara Games entitled Commissioned. What a way to bring a spiritual journey to life. Commissioned is not your ordinary board game. Written for ages 14 and up, it is a historically based strategy game that takes your back to Jerusalem 49 AD. Created with a cooperative style for 2 - 6 players, the game takes about an hour to play. Each player acts as one of Jesus Apostles, the they must work together to strengthen their individual faith decks, grow their congregations, overcome persecution and collect the books of the New Testament. All things that were done by the Apostles. But you do not need to be an expert on the bible or even history to play this game. I will admit that when we first opened Commissioned, I was very overwhelmed. Strategy board games are not my specialty, give me a good game of Candyland and I'm good to go. So it took me a bit to get used to setting up the game and reading the directions. I was grateful for the video to help me get set up so that I could help everyone else. Joey does have a couple strategy games that he enjoys playing, but ultimately Commissioned was a bit tougher for him to get. So we watched the video together at that point, I figured having him watch it himself would be easier. It did help. We were able to lay out the game and got a game in. I was very grateful that each game does not take that long to complete. When you have a child that doesn't like to sit for any true length of time, long games are a bad thing. When he needed to get up and move around, we were easily able to stop the game and come back to it. Since Joey has memory issues, I was concerned about him remembering his Bible stories. But again, just like in the game description, you do not need to have an in depth knowledge of the Bible and the people in it to play Commissioned. The game is well made. The storage box is not made out of flimsy material. The game board folds easily and also made of a strong board material. The cards and other materials are stored in included plastic resealable bags. Included also is a Theme Appendix, which describes the historical background of the people, places, and events depicted in the game. Commissioned is very reasonably priced for a strategy game of this level. At only $45.00, Commissioned will provide your family with many nights of entertainment. The girls were not able to play the game, and neither was Brayden. The age recommendation is pretty accurate. I think they may be able to catch up in a year or so, especially after we play a few more rounds of the game. I am very glad we have had the opportunity to review Commissioned from Chara Games. I look forward to the many other games that they have already had out and the ones still coming. We will also be getting the opportunity to review 3 Seeds, another new game from Chara Games. 3 Seeds is a short 30 - 45 minute card game where players get to use seed cards to complete their crops and reveal a hidden harvest. We are very excited about this opportunity. Several members of the Homeschool Review Crew were given the opportunity to try out Commissioned from Chara Games. So if you would like to see how other families used Commissioned in their homes, click on the link below to go through and see how they enjoyed it.